IPVanish has been at the top of the pile for the last couple of years. Does it still do enough to retain its crown? Nobody needs to discuss the fact that all of us live in the 21st century. And hence most of us carry out our daily tasks with the use of the internet. In fact, as far as internet consumption goes, mobile internet users have surpassed desktop users. Of course, none of that is relevant when you consider the fact that all users, whether desktop or mobile, use Wi-FI networks. We use Wi-Fi networks when we are at the airport. We also use them when we are at other places like coffee shops and libraries. That’s where virtual private network service providers come in. In other words, VPN services. IPVanish is one of those VPN services and it has consistently ranked as the best VPN service in the world for several years. It’s not the cheapest VPN on the market though. But to make up for that, IPVanish comes with a ton of advanced features and Security Gladiators have hooked up a 57% discount with our links. Moreover, it also allows P2P file sharing. And it allows that on all its servers. Not just special ones. If we were to sum up IPVanish as a VPN service, we would say that it is good value for money. Because of its features and the overall quality of the packages. As far as the number of devices are concerned, IPVanish allows users to connect up to five devices per account. The number five is a pretty standard one when it comes to VPN service providers. But there are other VPN service providers that offer more. For example, Hostwinds VPN, allows users to connect an unlimited number of devices per account. IPVanish does not keep any logs on its users. It has a strict no log policy. That obviously works pretty well for users who download a lot of files. It is also suitable for users who want extra security at all costs. In fact, the company doesn’t even track users who carry out their online activities when connected to one of its servers. For the end-user, this means they can engage in unlimited and unmonitored P2P file transfers. And it allows that on all its servers. IPVanish also does not throttle its customer’s connections and that is great for those who are heavy downloaders. Moreover, we don’t know of too many VPN service providers that allow users to use BitTorrent technology for whatever purpose they want to. Most of the VPN service providers restrict BitTorrent activity to certain VPN servers. Just have a look at NordVPN if you want to see it for yourself. And hence IPVanish takes an even bigger lead over its rivals because it does not restrict user BitTorrent activity in any way whatsoever. With IPVanish, you get unmatched flexibility and online freedom. Does IPVanish Has A Kill Switch Feature? The kill switch feature is great because it prevents the user’s machine from accessing the internet unless and until it is connected to the internet via a VPN server. If your VPN connection drops, the kill switch feature moves in and disconnects your machine from the internet. If you are unsure about using IPVanish at this point then don’t be. All IPVanish packages come with a seven-day money-back guarantee. The best thing about having an IPVanish subscription is that it works on all devices. To put it another way, the configuration options are so vast that you can’t really find a device with which IPVanish does not work. If you happen to have a Windows Phone or want to use IPVanish on Ubuntu, Chromebook or even internet routers, then you can go to the official IPVanish website and get instructions from there. But why would you want to install a VPN on your internet router? Because with a VPN-enabled router a user can secure all of his/her traffic no matter how many devices he/she has connected to that VPN-enabled router. The other advantage of installing a VPN on a router is that devices like Amazon Echo and PlayStation 4 can be protected. Normally, you can’t install VPN software applications on devices like Amazon Echo. They are difficult to set up on your own. Make no mistake, a VPN-secure router is a great way to save money if you have a lot of devices to protect. IPVanish, in order to facilitate users who don’t want to set up VPN routers, has established partnerships with various retailers who provide routers which are pre-configured for a VPN service. The only other reputed VPN service provider that does that is TorVPN. Of course, TorVPN comes nowhere close to IPVanish when it comes to features. Some VPN service providers go at great length to complicate the process of signing up for one of their packages for customers. IPVanish, for the most part, stays away from that. BY offering a simple pricing structure. And they are only differentiated by the duration of the package rather than any difference in features. In other words, all IPVanish subscription packages have the same features. The first package cost $11.99 $10.00 per month. Users can also subscribe to the second package which comes at around $26.99 for three months . IPVanish has cut the cost of the second package from $35.97 per three months to just $26.99 per 3 months. The third and the last package costs $77.99 and lasts for a full year. With the third package, you only have to pay $6.49 per month if you divide the annual amount by the number of months in a year. With our exclusive 57% discount, it comes down to $5.20 per month, making it one of the cheapest VPN’s on the market. Users are allowed to pay for IPVanish using any reputed credit card. Any user who is concerned about his/her privacy should pay IPVanish via Bitcoin. Bitcoin helps users keep themselves anonymous from the start of the process rather than after the payment is made. Other VPN service providers like TorGuard also allow potential customers to pay via prepaid cards which are bought from popular merchants. By popular merchants, we mean chains likes Subway and Starbucks. IPVanish may be expensive but, as we have mentioned before, it makes up for it with advanced features and robust applications. You’ll have to read the rest of this IPVanish review to find out how IPVanish does that. 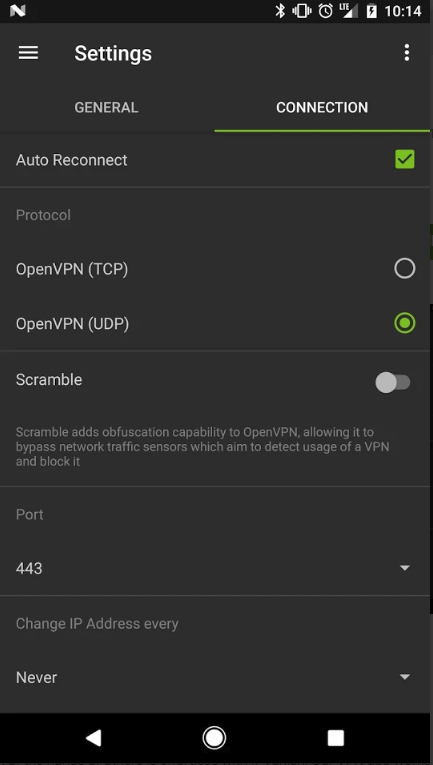 IPVanish supports multiple VPN connection types. This makes IPVanish VPN app a very adaptable piece of software. By default, the company uses the trusted and industry standard 256-bit AES encryption. All users get unlimited bandwidth and access to over 40,000 shared IPs. 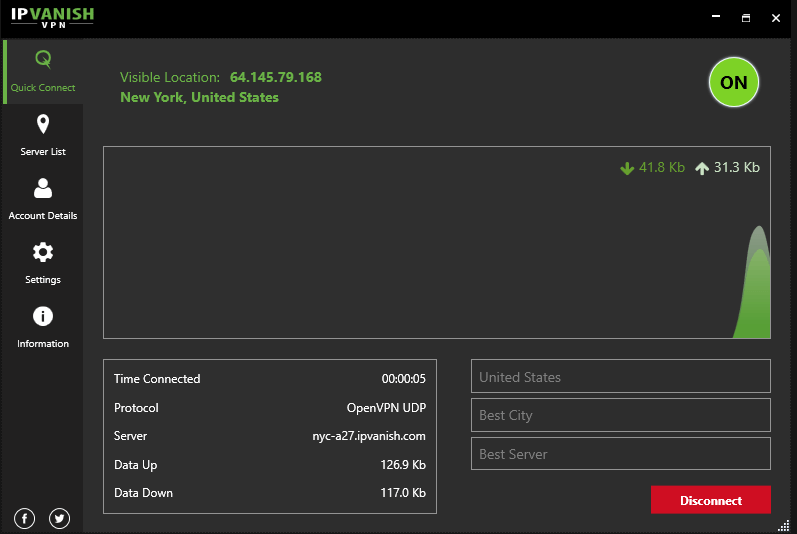 IPVanish offers new users over 700 VPN server locations. These locations are further spread in over 60 countries. Our research for this IPVanish review has shown us that there are very few, if any, VPN service providers that can match the completeness of IPVanish VPN server location list. Apart from being comprehensive, it is also pretty large. IPVanish has recently stopped its operations in a country that goes by the name of Russia. Because of the country’s local laws. Essentially, the laws in Russia conflict with how IPVanish wants to serve its customers. Mainly that Russian laws don’t allow IPVanish to have “no logs” on its customers. But IPVanish isn’t the only VPN service provider that has suspended offerings in Russia. Private Internet Access, another industry giant, has taken the same decision regarding Russia. If you are using any modern machine, then the whole IPVanish application installation process should not take you more than a few seconds. That is true even if you are using Windows 10. Besides, the installation process itself is a guided one. So you don’t have to think too much about anything while installing IPVanish. Perhaps the only area where IPVanish doesn’t blow its competitors out of the water is in its app design. In short, IPVanish VPN application is not pretty. It has a somewhat minced green and black color theme. Apart from that though, the interface is great. There are tabs on the left-hand side which allow users to gain access to a list of VPN servers quickly. Moreover, these VPN servers are organized. Moreover, the list of VPN servers is also searchable. Which obviously saves users a lot of time. IPVanish and NordVPN both do a good job of providing users with fast links. These fast links can be accessed for very specific cases. For example, one of these links can grant the user access to the fastest available VPN server. Another allows the user to tweak the VPN server for gaming. There are also servers which are optimized for streaming videos in any specific country. Needless to say, all of these are great features. In fact, we think that other VPN service providers would do well to copy IPVanish model. IPVanish app has a lot of customization options. It also has a ton of advanced features. But it doesn’t make the mistake of presenting all those options to the user in one go for the fear that it may confuse a new user. Instead, IPVanish VPN app hides those extra options. Until, of course, the user needs them. To take an example, the VPN app allows the user to change the IP address of the user’s machine automatically after a specific amount of time. But the user has to access the options menu to activate the feature. 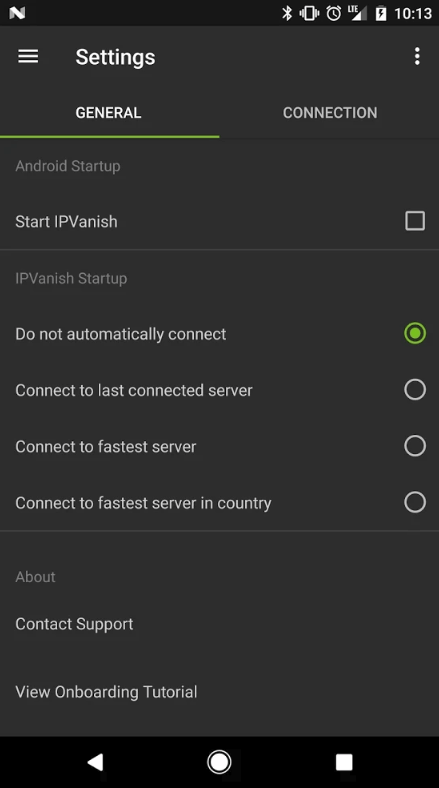 More geeky users can configure the IPVanish VPN app to start automatically on each reboot/startup. There are a few other configuration settings as well. New users don’t have to worry about all these advanced features. Because you could use IPVanish VPN app without ever coming face to face with any one of these features. In other words, IPVanish VPN application works right out of the box without any need for configuration. In the VPN business, it is extremely important that users can use your VPN app as soon as possible and with as less effort as possible. IPVanish hits the bulls-eye on this one. Don’t like to use a VPN app that has too many features? With IPVanish you can connect and then reconnect along with disconnect via the tray icon as well. You don’t have to engage with the main VPN app’s interface. The system tray icon also helps the user to change his/her IP address. It even has options to select a particular VPN server from any given list. Of course, the list isn’t as large as the one that the user can access via the main interface but it is still quite useful. Other VPN service providers such as Private Internet Access do away with the VPN app from the get-go. They make up for it with a robust system tray icon. This helps those users who are hell-bent on decreasing the amount of clutter and distractions on their screens. 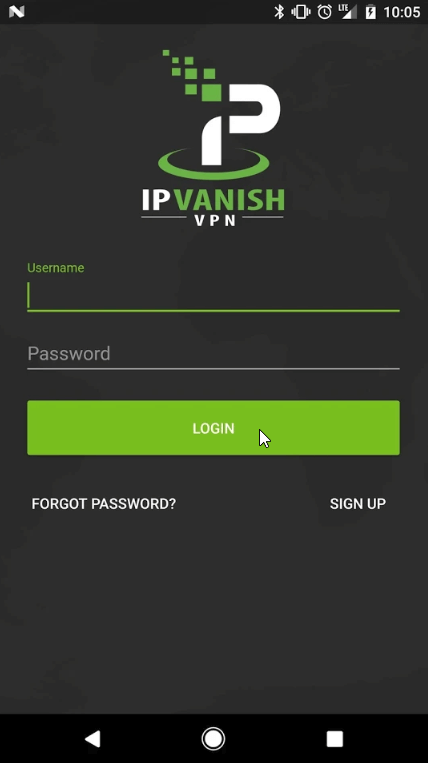 There is no doubt about the fact that IPVanish has put in a lot of effort and thought into its VPN application. And because of that, you shouldn’t have any trouble in using it. 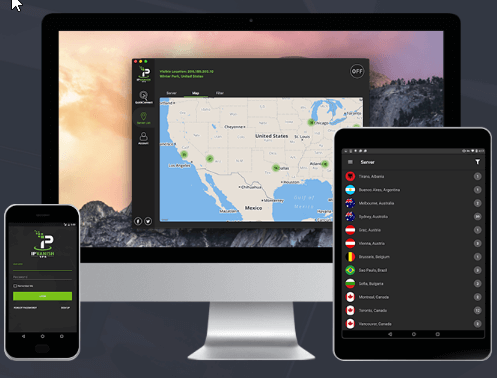 Keep Solid VPN Unlimited has the better user interface and NordVPN displays more relevant information via its client, but IPVanish strikes the balance. All VPN services affect your internet connection. In other words, expect to have your web browsing experience change when you connect to a VPN server. Most of the times, this translates to lower download and upload speeds. You are also likely to face greater latency rates. If you connect to VPN servers that are physically far away from your physical location then you will experience a slowdown. But that’s the rule in the VPN industry instead of the exception. The only “exception” we know of is PureVPN. PureVPN can, sometimes, increase browsing and download speeds. Which is of course, unexplainable. But to measure the real speed, you have to perform the speed tests multiple times. First, using servers which are physically closest to your location. Expect these type of VPN servers to give the fastest download speeds. Speedof.me automatically connects the user to the closest server and then tests the speed. With speedtest.net you can select the server you want to connect to. And hence, by selecting the one that is furthest away from your location will allow you to accurately measure how fast IPVanish really is. Our research for this IPVanish review has shown that IPVanish is a fast VPN service. It does increase latency rates by about 250 percent but worry not. When it comes to the VPN industry that number is pretty decent. PureVPN has the lowest latency rate increase and it increases latency rates by around 180 percent. With that said, latency rates will not inhibit your routine web browsing experience. IPVanish is fast enough to not ruin your web experience even on media-heavy websites. As far as download and upload speeds are concerned, expect IPVanish to improve those by around 10 percent when connected to international servers. Of course, a 10 percent increase is nothing much to talk about. Other VPN service providers such as VPN Unlimited actually slow down your internet connection by as much as 30 percent. PureVPN is still the best when it comes to improving download speeds. Expect IPVanish to decrease upload speeds by around 40 percent. That isn’t great but VPN service providers like NordVPN also decrease upload speeds by 30 percent. Use sites like Speedof.me to connect to the fastest servers. Our research for this IPVanish review tells us that IPvanish does not negatively impact latency rates on its fastest servers. 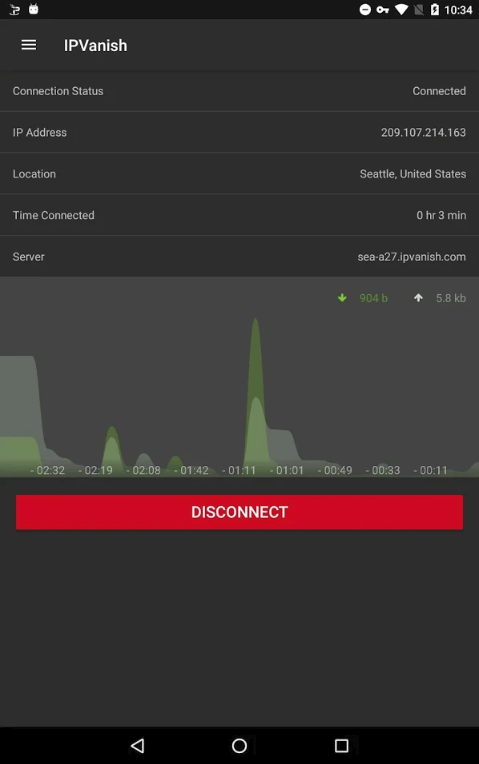 After all is said (and tested), IPVanish does decrease your download and upload speeds if you connect to local VPN servers. But of course, IPVanish performs better than 95 percent of the competition. There is hardly a VPN service provider out there that can out-perform IPVanish in terms of speed and performance apart from PureVPN and maybe, NordVPN. In other words, numbers don’t matter much in the real world. Network conditions, most of the time, are too unstable to rely on them. Instead, you should judge IPVanish by your experience. What do we mean by experience? Look at how IPVanish performs while loading videos on streaming websites. Our research for this IPVanish review tells us that IPvanish can hold its own while playing HD YouTube videos. Of course, expect to see a lot of buffering while playing 4K videos. Should You Sign Up For IPVanish? There is hardly anything IPVanish doesn’t do well. It doesn’t have an attractive user interface for its VPN apps but they are fantastically usable. The billing system is also simple enough. Add to that the set of online security tools that IPVanish offers and you can see why it is so well reputed. IPVanish also has native apps for almost all major operating systems and platforms. As far as international VPN serves are concerned, IPVanish is one of the few VPN service providers that improve the overall web browsing experience and performance. Along with that, IPVanish enables users to experience unrestricted P2P file sharing. BitTorrent activities are also allowed on all its servers. If that wasn’t enough for you then IPVanish also has hundreds of VPN server locations which are distributed neatly all over the globe. Consequently, regardless of your current location, you can find a VPN server close to you. The VPN company also offers specialized servers so it doesn’t matter what you do on the internet, IPVanish has got your back covered. In return for the great speed, great features, and great overall experience, IPVanish demands a premium. In other words, it is more expensive than its rival VPN service providers. Some other VPN services such as NordVPN, Keep Solid VPN and Private Internet Access offers similar features sets albeit for less money. But if you’re a heavy-duty user and downloader than IPVanish will take care of your every need. IPVanish is the only complete VPN service in the market today. IPVanish is one VPN service that completely secures the user’s online traffic from the likes of ISPs and government agencies. Moreover, IPVanish offers users extra security features which are great for users who want extra anonymity. IPVanish is amongst the elite group of VPN service providers that actually improve web performance. But for all that greatness, IPVanish demands a premium price. 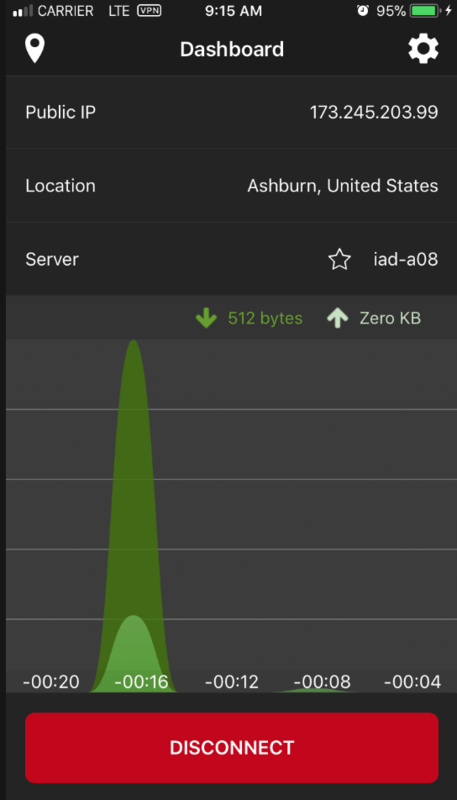 IPVanish worked great for me until Windows 10 did a major update in May 2017, since then the download speed is too slow to watch tv online, even if I use a server a few miles from me. Netflix works and my speed tests are adequate as is my WiFi. My android tablet still works properly but not my desktop or laptop. IPVanish needs a fix to work with latest Windows 10. We have checked our Windows 10 machine and have found IPvanish fast enough. Try to use a server that doesn’t have much load. Moreover, make sure none of your web browser add-ons are actually slowing down your online streaming experience.